QuiBids Ads are pop-up advertisements and web banners which can be displayed by websites and adware programs. QuiBids Ads invite you to bid at QuiBids’ auction, which features various products, including fashion items, home appliance, mobile devices, photo cameras, and the like. QuiBids Ads may be displayed on websites such as mediatakeout.com and hockeydb.com, and, if you want to get rid of those ads, you have to either close them or leave the website. When QuiBids Ads are displayed on non-commercial websites, such as Facebook and YouTube, it is sign that some adware program may be present on your computer, in which case the program should be removed in order to rid the browsers of the annoying pop-ups. 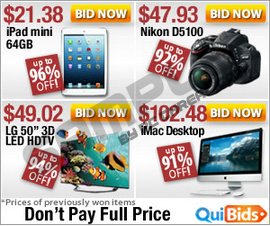 QuiBids is an American online retailer that operates as an auction. In order to bid, you have to sign up and purchase so-called Bids, each of which costs $0.60. Every time you place a bid, the price of the product increases by one QuiBids penny. As appealing as the service is, it has been treated as a form of gambling because QuiBids’ customers allegedly lose money when bidding. QuiBids.com is not monitored by any third party as in the case of Ebay’s auction. QuiBids also offers consumers the Buy it Now option; however, the total sum spent on bidding, the price of the product that you want to buy, tax, and shipping are likely to make a much higher amount of money that you would normally spend on some other retailer’s website. Instead of using penny auctions, you should stick to more reliable auctions. As for your privacy online, it is worth scanning the system once you find that QuiBids Ads or some other advertisements are displayed on websites that normally do no operate in this way. If your Internet Browser or some other Internet browsers contains an adware program, you may be monitored by the adware application. It may record your clicks, search terms, impressions, browsing history, browser type, browser language, and some other non-personally identifiable information. Even though adware programs are usually aimed at collecting only non-personally identifiable information, the program providing you with QuiBids Ads may record some personal information. The sooner you remove the unwanted application from your PC, the sooner you can shield the system from numerous computer threats, so take action right now. We recommend that you implement SpyHunter because this anti-spyware tool can readily examine the operating system and delete various computer threats. The recommended application can fight off rogue anti-virus programs, ransomware infections, adware, browser hijackers, and many other malicious programs. In case you want to try removing the adware program manually, use the removal guide provided below and scan the system afterwards. Quick & tested solution for QuiBids Ads removal.